The Perry’s were visiting in Germany and dropped in on a visit with “you know who” Gerson and his wife Brittney! They also have a new baby boy! Praise the Lord! Josh and Christy had a blessed time. But now they are in Israel, so please continue to keep them in your prayers. 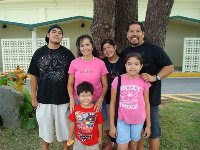 God bless you Perry’s and God bless you Gerson and family! Taking the train back to Tokorozawa there was time to reflect on the past two days. Being with the Nagano congregation was such a blessing! You realize that God is doing a good work all over Japan. Different cities but we all have the same calling; to glorify the Name of Jesus Christ. I told them that I would be ok, but they insisted that they take me all the way to the tracks. I was so blessed but sad to say goodbye. There were big hugs all around. This is Go and his wife and kids. Aya is an aunt 3 times! These kids are adorable. It was great sitting down and just chatting. Aya has a cool brother. We left the house early Sunday morning; 7am. Aya's parents took me sightseeing in the mountains. We visited these cedar trees that are over 400 years old! Look close at the photo and be "blown away", see how small these people are? These trees are huge! It was such a blessing to be able to stay at Megimi and Hideo's home. They were so hospitable. Their house was absolutely beautiful! Aya has wonderful parents. I made it safely to Nagano. Pastor Kazu and his wife took me to visit their church. Then we headed out for dinner and some coffee. It was such a great time. Getting to know each other. We tend to think that all of Japan is like Tokyo, tall skyscrapers, millions huddled together. But on the bullet train you see a lot of the countryside. Green trees, single family homes, it is absolutely beautiful. The picture does no justice because we are close to the typhoon, a lot of rain. The "Shinkansen" (the bullet train) this thing will travel up to 300km per hour! That is about 180 mph, incredible! I have an hour to Burn. So I decided to grab something to eat before I jump on the "Shinkansen" (the fast train) to Nagano. It will take about two hours. I cannot believe the weather change from Okinawa toTokyo. Is is really cold here. The Typhoon that hit us will be here at 6pm. The trains will stop so I have to get to Nagano fast. We are about to depart. In case of the Typhoon they said that they will redirect our flight to Kobe. Hopefully that will not happen; but we are on God's time clock. Feeding a mini army gets easier each day. But then you stop and think "this is a lot of food, three times a day seven days a week". But really, we would have it no other way. These students are a real joy! Emi did a good job of translating for Logan into Japanese. It has been a real blessing having Logan with us this semester. He is a local boy coming out of Murrieta California. It was such a blessing to meet Rika's sister and Mother. They are just visiting for a few days and they got to know their future son-in-law. Next up, the big man; Rika's Father, watch out Rob! There is a typhoon heading our way. It is supposed to pass to the right of us and then head up to Mainland Japan. The only problem is that Eder and myself are heading up to Tokyo around that time and we might get stuck in the middle of the mess. Please pray for us. For God’s perfect timing and direction. Also please pray for everyone’s safety. We kept the Mexican theme going since we were on a roll. We made albondigas soup and tostadas. It was the first time that Hyan-chul has ever ate this type of food, he said that he liked it. NEWS FLASH - It is Official! Rob and Rika are engaged! Yes! We are so blessed! He popped the question Friday night. We will let him give you the details. Please write them a greeting below! We had our special couple's dinner at the Koinonia Cafe. This months special; chimichangas! They were delicious. Plumeria's are absolutely beautiful! I planted this after Joe Maclehaney gave me a shoot before he left island. This year it finally gave us some flowers and we are blessed. They are beautiful! The Bible College continues to expand it's food menu. Now almost daily; homemade soup. The kitchen crew often serves along with our menu different types of healthy soups and they are delicious. We were so blessed by the testimony of Brandy. God is doing a good work on her life, and has a big calling in store for her. Thank you Jesus for bringing her to us this semester. Typhoon Megi has been sticking around causing a lot of damage in the Philippines. 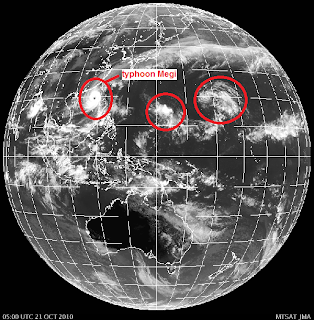 But there are now two more brewin in the South Pacific. Please pray that they just blow away and do not cause any damage. We have been blessed here in Okinawa not to have had any direct hits in the past couple of years. Lord, keep us all safe. Because of his birthday we were able to have his favorite dinner; Taco Rice! We arranged the tables more family style. It was blessed dinner. The girls made a special cake for Asa. Happy 8th Birthday Son! Asa had a little party with his students during lunch today. Joanna brought cupcakes for all his classmates, they had a lot of fun. We are studying in the library above the cafe. We got a lot of homework done today. This is the week of midterms. Anna received her gaijin card from the city office today, Praise the Lord! She has been such a blessing to the church and Bible College. We look forward to what God has in store for her here. We are so excited for the new baby! In a few more months the baby will be born. Here are the girls at the takoyaki party. Hey, who is that girl in the back ruining the photo? The first one went so good we decided to have another one, and this one was bigger. Add to it the snow cones (kakigori) it was out of this world! His birthday is not until Tuesday but the festivities have already begun. Asa wanted to invite the students so about 20 of us headed out for lunch. We had a great time. It looks like they are having a lot of fun. Picking peanuts from the ground up. Hey Travis, I ate some chestnuts in Korea and fell in love with them, I cannot get enough. Asa always falls asleep on the dentist chair. Not me, I am too nervous. They are so patient with the kids. At least he is having a good time. Well, most of us, the rest had to visit the restroom. The flight was fast and a real blessing. Thank you Lord that everyone made it back smoothly through immigration. Now it's back to the cafe to study the Word. We had a great time in Korea but now we are heading back to Okinawa. God has given some of these students some good vision. We are looking forward to what the Lord has in store for us next. The house was packed! But it was so much fun. We ate, talked, ate some more, I think that the students almost popped! Again, we were so blessed to be with the Reedy's and Pastor Lee. But then it was time to head to Incheon airport. The airport is about 1 hour away from Seoul and we still needed to check into the hostel. We have to check in at 7am at the airport, so that will come fast. Once you meet the Reedy's you can never forget them. They made such a big impact on our lives when we first moved to Okinawa. Debbie is a wonderful cook! She went ALL out for the students, Mexican food and everything was homemade! She also baked cookies, muffins, you name it! Thank you Ralph and Debbie, we were so blessed to come and be a part of your family again. Also, we were able to meet Moses and Hyunchul's pastor, Pastor Jonah Lee. It was great spending some time together. The train ride from Daejeon to Seoul station will take a little under 2 hours. We could have ridden the faster train but we would have only saved about 1/2 an hour. The slower train only cost about 10 us dollars. Transportation is so reasonable in Korea. As you can see, the seats were comfortable and smooth. Great for catching up on sleep. These guys keep you up late at night. We had such a great time in Daejeon. Thank you Pastor Mike and Daniel for showing the team such a great time. Thank you for allowing us to minister at the church, we love the people at CCDaejeon, and we know that they have impacted the students in a great way. Praise the Lord! God bless you Trevor, have a great time with Daniel and be blessed, it was so good being able to spend some time together. I look forward to seeing you again soon in Tokyo. Time to head to Seoul! What a blessing! Our brother from Sapporo has arrived. Safe and sound he came into Daejeon about 9pm tonight. Daniel had to take Brandy back to her house, so Trevor tagged along and then they were going to get something to eat. God bless you Trevor, great to see you again. We did a lot of walking today, and even now we are heading for dinner. As you can see these guys want to find a place just to sit down and relax. We are meeting the rest of the group tonight, it should be a real blessing. Hang in there team, remember, we can sleep on the airplane. Wait, no we can't there are chuck tracts to be done. We all had some good ice cream to eat. The last time I ate this type of ice cream in Korea it was close to freezing. The weather has been real nice, good weather to eat some good desserts. The guys were diggin it. I don't know if these guys are tasty critters but I guess that they will make some good soup. Don't worry folks, these turtles were raised for food and most likely were not out in the wild. At the Korean markets you can find almost anything to eat. We did a lot of walking with the gang today. We saw some peculiar things; talk to Moses about that. Some things looked tasty and some were well let's just say interesting. They boyz have arrived and we are blessed to have them join us. Tomorrow we head up to Seoul to see the Reedy's and Pastor Lee. What is Cole doing with a wig on his head. We will let him explain it to you. Our crazy brother. Like always the Lord shows up when you give Him the opportunity to move. The afterglow was such a blessing here in Daejeon. You feel so full after a time like this. Thank you Jesus! Zach sent this picture of the worship style at w2 this Sunday night. It is always a blessing to gather together for some worship on Sunday night. This evening the team were able to share their testimony with the church in Daejeon. It is amazing to see the work of God in the students life. Their testimonies are incredible.